In the most anticipated game on Sunday between Manchester United and Chelsea have been officially been called off due to bizzarre weather in London. The match supposed to be a cruncher with millions of fans anxiously waiting to support the Red Devils and Blues, now would have to wait for the next date to be announced. According to Chelsea official website it read as:"Sunday's game at Stamford Bridge has been postponed following consultation with the police and the local authority." 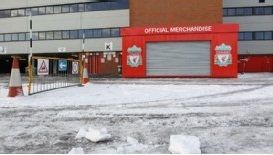 In the other important Premier League matches Liverpool and Fulham were to clash on Sunday , which also were washed about for Sunday. The weather took abrupt change in the authorites decision in calling it a day. Though the Anifield surface would have been a perfect choice, but the temperatures forcasted would have made it very difficult to play. So taking everything in consideration this decision had been made. In other matches Arsenal and Stoke, Wigan with Aston Villa on similar grounds have also been called off. On the other hand Blackpool's home match with Tottenham on Sunday is subject to a pitch inspection, while a host of games in the lower leagues and in Scotland have also fallen victim to the weather - with Celtic's clash at Hamilton also off.